From communication to education to transportation, new technologies designed to enhance and reinvent how we live, learn, socialize and do business are constantly emerging and evolving. So what can we expect in the year ahead? We asked some experts for their insights into some of the tech innovations likely to make waves in 2016. When IBM's Watson supercomputer first entered the public consciousness, it seemed like little more than a television gimmick. The cognitive computing system made its public debut in 2011, when it defeated former "Jeopardy" champs Ken Jennings and Brad Rutter. But in the years since, Watson has grown into a sophisticated utility player, with its powerful processing capabilities being put to use in a number of important sectors like health care. In 2016, this kind of computing system -- able to process massive quantities of data, far beyond what humans could handle -- will increasingly make its mark. Watson's functions are realized through a set of application program interfaces (APIs), which are protocols and tools used to build software applications. This makes the computer's natural language processing possible (Watson currently knows English, Arabic, Japanese, Spanish, and Brazilian Portuguese) and allows it to understand the associations represented in written texts and vocal expression. Watson can also identify visual expression, meaning it can understand the information conveyed through an image. In addition, Watson's cognitive computing abilities allow it to "cover other aspects of the human condition, areas called 'emotional intelligence,' " Rob High, CTO at IBM Watson, told CBS News. "This is the ability to understand what kinds of emotion people are experiencing or what they are expressing in their text or voice or visual representation or expression." As Watson becomes smarter, and in a way, empathetic, High said this kind of technology will increasingly be applied in some surprising ways. One area of innovation involves so-called "social robots." High says IBM is doing experiments with robots that "have a near-anthropomorphic form" -- they are human-like, but not too human-like, he added, which is a tricky balance to achieve. "The machine can leverage the ability to manipulate arms and fingers and heads and faces, and the idea is for it to listen to the words and intonation and body language of the person it is interacting with, which will reinforce our understanding of that person's intended expression," High said. While IBM and has no "announceable product" at the moment, keep an eye out for such robots in the future. What is the point of having this real-life C-3PO? High said he envisions robots being used in hotel lobbies or as concierges, which is already starting to happen. They could be useful in any customer service or hospitality function. The fact that a robot's computer "brain" is now nuanced enough to assess and respond to the behavior of the person it's interacting with could be indispensable for any business. High said that while this may sound like an episode of "The Jetsons," it is all about "advancing the value of cognitive computing in the everyday." "We believe that this is going to be a pivot-point marketplace in 2016," he said. "Cognitive computing makes for a better human-machine relationship." Medical futurist Dr. Bertalan Meskó cited another company, Boston Dynamics, acquired by Google in 2013, as one of the most promising in the robotics field. While the company has only released videos about Petman, an anthropomorphic robot, as well as robot animals since the Google acquisition, expect it to be more prominent in 2016. Meskó said that in the coming year, many of Boston Dynamics' programs will be moving out of the development phase and closer to the production line. High says such innovations are not just for business. Cognitive computing technology will increasingly infiltrate our everyday lives. "I tend to believe that what we will find is that cognitive computing will end up permeating almost every aspect of our human life as a mechanism by which we end up amplifying the human condition in ways we don't expect to do so," High mused. "I don't think cognitive computing is at all confined to the enterprise industrial problems. I think it is relevant in the lives of professionals, it is relevant in the consumer spaces, and relevant in the mundane day-to-day decisions that we make. I mean you ask Siri questions all the time on your phone. And she answers." High said that part of making cognitive computing an indispensable part of daily life is to make it feel like part of the family. "With Echo or Siri, you ask what the weather's like in Las Vegas, they'll tell you, but what I really want to know is what clothes do I need to pack," he said. "I ask the same question to someone in my family, and they know the answer to that question, and answer not just in terms of what the weather is like outside, but they anticipate what I'm really asking about. My family can interpret that question contextually in a way that is much more meaningful to me -- that's what I think the future of cognitive computing is." Another field where we're seeing rapid strides in technological advancement is medicine. Science magazine recently declared CRISPR, a newly developed gene-editing tool with wide-ranging implications for medicine as well as basic science and agriculture, its 2015 "Breakthrough of the Year." In 2016, expect to see even more medical game-changers. "In 2016, medical technology is going to be democratized, handheld, cheaper, and more mind-blowing than ever," Meskó, a self-described "geek physician with a PhD in genomics" and author of "The Guide to the Future of Medicine," said in an email to CBS News. "We need to get used to seeing science fiction in daily news." From virtual reality to "3D bioprinting," some of the developments Meskó highlighted would have sounded unthinkable just a few years ago. Meskó noted that today innovations in medicine reflect broader shifts that are happening across industries. 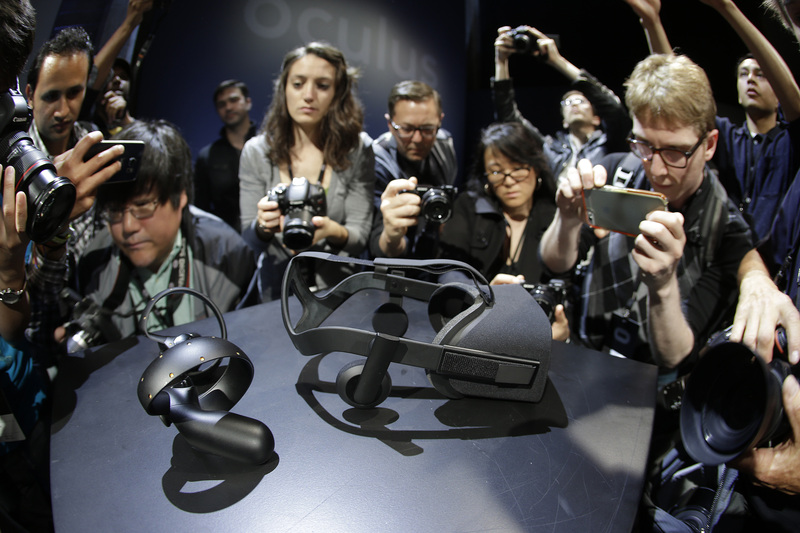 For instance, once Facebook's Oculus Rift headset hits the market, virtual reality will become "a booming industry." "Imagine using virtual reality in teaching medical students about anatomy and pathology. They could virtually dissect any materials without the formaldehyde smell. Moreover, they could simulate hospital issues and processes before testing their skills on real people," he said. Beyond virtual reality, artificial intelligence will play a larger role in hospitals. IBM's Watson cognitive computing system has already been helping doctors make diagnoses and treatment more efficient, Meskó said. He said this has been particularly impactful in radiology. IBM's ambitious Medical Sieve project aims to develop a cognitive medical assistant that could someday improve decision-making in the difficult fields of cardiology and radiology. It "aims at making radiology better by letting radiologists focus on the important questions instead of checking hundreds of images every day," he explained. Another key medical innovation on the horizon is 3D bioprinting of tissues and eventually entire human organs. Meskó wrote about Organovo, a company that's made the 3D printing of biomaterials a priority. The company announced that it successfully bioprinted liver tissues in 2014 and said that the printing of liver parts for transplantation might be a mere four to six years away. "But first these bioprinted livers would be used in the pharmaceutical industry replacing animal models when analyzing the toxicity of new drugs," he wrote. "I think a commercial service could be available [in] 2016." On the consumer end, what can people expect from the mobile tech market in 2016? CNET Senior Editor Scott Stein said that 2016 should prove an interesting time, with virtual reality making its big consumer push in the market, the Apple Watch trying to find its footing, and the world becoming more and more connected with wearables, tablets, and even cars working seamlessly with one another. "It's an interesting time because we have hit a peak with phones. Phones are all so good, tablets are all so good now, there's always this question of 'do you need to upgrade?' Especially with tablets. iPads dipped in sales, because people said 'I already have one,'" Stein told CBS News. "In the coming year, you really will see what you've already been seeing -- tablets being more like computers. Microsoft nailed it with that. Apple is exploring that with the iPad Pro. I don't think they will fuse the Mac with the iPad, I used to believe they would, but I do think we will start seeing the iOS become much more versatile." Stein said the difficult question consumers always face is: What's the point? "The other day, everything was on my desk, and everything started ringing, it was ridiculous," he said. "You see now that you can answer calls from different devices, whether it's your phone, tablet, computer, or your car, which is a separate huge trend. All of these companies now, from Microsoft to Google to Apple, are pushing to increase connectivity. I think interconnectivity is one of the big themes (of 2016)." While the standard mobile devices we have all come to know and love will continue to dominate the marketplace, Stein believes that the big consumer tech story of the year will be virtual reality. He said that by April, products like Oculus Rift and HTV Vive will hit the market, and while the technology will be a tough sell at first, it will eventually grow into an indispensable, ubiquitous aspect of daily life down the line. "They don't look like they'll be appealing. They don't look like something that could fit into your life. There are a million reasons why virtual reality devices look problematic -- I mean you have big goggles, it's clunky to set them up," he said. "The upside is that most people who use these find them stunning and basically this pure virtual reality experience is something that people find amazing. They find it transformative. It's immersive. It feels like you are somewhere else." Stein suggested that the challenge to these companies pushing for virtual reality is to make the technology feel less like a novelty and more like something useful. "In years to come, it will get better. Google, Facebook have their eyes on the much longer game. I mean stuff that involves telepresence and interacting with other people -- that 'Star Wars' kind of technology is not going to be there right now," he said. "I think they are working on this augmented reality stuff that feels like your real world." As far as wearables are concerned, Stein said it will be important to look at what happens with the Apple Watch. Despite the fanfare, 2015 did not become the "year of the Watch" as Apple had hoped. "They don't 'wow' people. People look and think, 'okay, I don't know if I want that.' Fitness trackers are popular, however, and I think we'll see bigger leaps next year with a lot of companies looking to collect data and coaching you more. Apple Watch 2 will come and Android Wear watches continue to improve, so we'll see what happens with the smart watch trend in the next year," Stein suggested. And expect to see more connected home and car technology in the year ahead. "There have been some fascinating developments in the past year with cars. I mean, Google showed off a lot of its self-driving car, then there's Tesla -- I was blown away. The auto-pilot on an actual road is terrifying, it's already here. The connected car is here, the doors are all open now. I think you'll start seeing a ton on that front," Stein said. "Similar to that is the smart home -- I mean Apple announced its HomeKit, and now that that is in place you'll start to see the actual interesting stuff start to come next year." About 65 percent of all American adults use social networking sites, according to the Pew Research Center, up from just 7 percent a decade ago. While the stereotype of the typical social media user revolves around the smartphone-obsessed millennial (Pew reports that a full 90 percent of young adults 18 to 29 use some form of social media), older generations have adopted it too. In 2015, 35 percent of all U.S. adults 65 and older were on social media, a figure that has tripled in five years. In the coming year, expect this social media reach to expand further, and migrate increasingly to apps that are making more traditional communication tools obsolete, according to Victor Pineiro, who in 2013 was named one of Business Insider's "30 most creative people in social media." "There is this idea of social media's momentum moving at the speed of light. Look, in the first three years, people got away with just having Facebook and Twitter. But in 2013 and 2014 there started to be a lot of new channels, and then people started saying, 'What about Snapchat? What about Vine? Instagram?' So, now, quickly everyone starts paying attention to what's the next one? What's growing? What's dying?" said Pineiro, who is vice president of social media at Brooklyn-based digital agency Big Spaceship. In 2016, he says people should expect to see messaging platforms eclipse traditional social networks. "I think broadcasting, especially right now, is either semi-antiquated or has a very specific use case. You have social gaining popularity, everyone's lives are being broadcast as part of personal brands. We are going to the messaging route now because you have people saying, 'I just want to talk to a select group of people, why am I going to shout out to everybody when I can have a select group of people I show my jokes to?'" he said. By 2018, an estimated 1.1 billion new users will be on board the messaging app bandwagon, according to statistics from strategy and technology consulting firm Activate. Pineiro asserted that this trend reflects the need that both marketers and users have of creating personalized, incredibly specific content. Ironically, in a social media age that brings a wide cross-section of people from around the world together, in 2016 messaging apps like WhatsApp and Snapchat will continue the drive toward content that is more specific and targeted. This trend has fueled the rise of app-based celebrities, people whose creative use of apps like Vine or Snapchat helped them build out a fan base from the niche to the mainstream. The emergence of these viral stars signifies a broader change in behavior for the average user across the board, Pineiro added. "People are starting to see themselves on path to try to be an influencer through social, which is more popular than we generally suspect," he said. "You have people on that path right now who think, 'Ok, I have this post going viral on Instagram, then how do I tailor this content to appear on other platforms, and then how does this give me leverage for other avenues, like Hollywood?' You have this fork in the road where some people are looking for fame and then others are just using social media as a tool that is just for private messaging -- they aren't broadcasting. Of course, all of that immediately changes when you have a kid and you start posting baby pictures everywhere," he joked.